I desperately wanted to like this release. 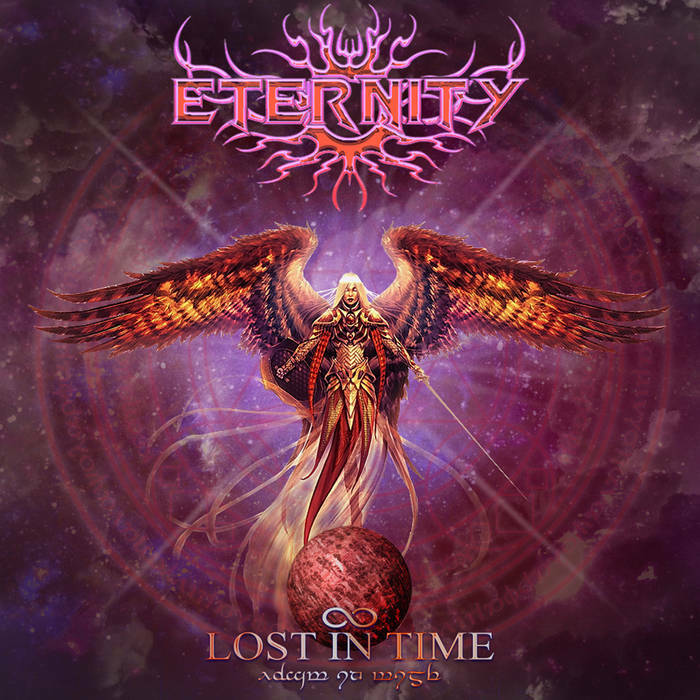 I mean, a band called Eternity produce a melodic power metal album set in a sci-fi/fantasy concept world with beautifully celestial artwork…how could I not like it? Well, unfortunately, the Serbian duo’s debut is an incredibly flawed work let down by annoying technical hitches despite being well-written. Firstly, I’d like to address the fact it’s only six tracks long (one of those being a cover). That, to me, is apt EP length, not a full-length studio album. Although – admittedly – the more I hear it, the shorter I wish it was. Eternity’s Lost In Time is plagued with one enormous fault, accompanied by a couple of mini-faults that surround it. With a strong stomach, this could whet any Force Majeure fan’s appetite, but that stomach has to be strong enough to tolerate some of the most pitch-impaired vocals this side of Gaia Epicus. In no way is this just going to be a slating of one man’s talents. Not least because his tone and harmonization can actually be pretty good when he sticks to his admirable mid-range. I feel comfortable throughout the layered sections of “Illumination X” and the opening verses of “Old Gods” because he feels comfortable. But whenever falsetto becomes necessary, such as the hideous Dragonforce cover, it makes me physically wince. Pronunciation is excellent but, in the kindest way possible, serious practice is required to be an expert power metal clean vocalist. On the plus side, there are quite a few instances of harsh vocals dotted around the place – especially towards the end of the album – which are performed with aplomb. Five minutes into “Old Gods” we get our first taste of them and they not only add an extra dimension to the music, but create character which I can tell the band were going for due to their detailed account of the ‘story’ on their website. Musically, Lost In Time is very accomplished. Big progressive structures that fit snugly and concisely into 3-6 minute timeframes; excellent guitar work both in terms of virtuosic solos and heavy riffs; fluid vocal patterns (questionably executed); and well-mixed keyboard effects which add an important extra layer. They really help boost the melodies, especially in “Hero’s Call”. Disappointingly, but expected for an independent project, the production values leave a lot to be desired. They may have used the overrated Drumkit From Hell program, but at least it’s programmed expertly and fuses with the rhythm guitars. The sore thumb is how far forward the lead vocals are thrust, becoming almost penetrative in quality. The highlight of the album has to be the driving “Seat Of Pantheon”, which makes the most of its riff-centric structure and is a real headbanger. The title-track also has its moments, coming off as very Numenor-esque with its death growls and high tempos. Eternity definitely have potential. There’s always room for a European power metal band with huge sci-fi concepts and progressive ideas. This time, unfortunately, it’s the amateur tribulations of being newcomers that let down Lost In Time. While trying to sound the least patronizing as I possibly can: more practice needed. This entry was posted in Bands, Power Metal, Progressive Metal, Reviews and tagged 5.5/10, dragonforce, Eternity, European power metal, Force Majeure, Gaia Epicus, Independent, independent reviews, Lost In Time, power metal, progressive power metal, Serbia, Unsigned/Independent.